Sorry... the 2017 GMC Terrain is no longer being sold as new. Instead, take the first step to a great deal on 2019 GMC Terrain with a free price quote! Newly available Nightfall Edition with black-clad exterior details and wheels. 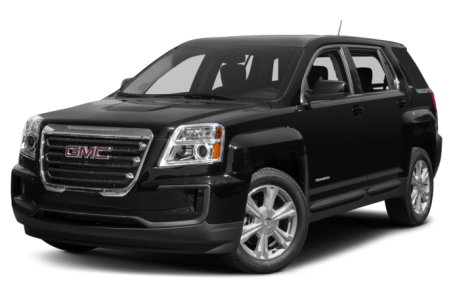 The 2017 GMC Terrain is a compact SUV that seats 5 passengers across two rows. It competes with the Ford Escape, Mazda CX-3, and Chevrolet Equinox. Five trims are available: the SL, SLE-1, SLE-2, SLT, and Denali. The Terrain has a muscular, boxy design. It features enlarged headlights and an oversized front grille. The blockish fenders bulge out in an imposing manner. Chrome accents can be found through the exterior, which gives a more premium look to the Terrain. Standard features include power/heated side mirrors and power windows/locks. Optional features include LED daytime running lamps, a dual-pipe exhaust system, a power liftgate, a power moonroof, and a trailer hitch receiver. The Denali model comes with metal mesh front grille, chrome accents for the exterior, and unique 19-inch wheels. The newly available Nightfall Edition includes black-clad exterior details and wheels. The Terrain is powered by a standard 182-hp, 2.4-liter 4-cylinder engine mated to a 6-speed automatic transmission and front- or all-wheel drive. A 301-hp, 3.6-liter V-6 is also available. Fuel economy for the 4-cylinder/FWD model is an EPA-estimated 21/31 mpg city/highway. It drops to a 20/28 mpg rating for the V-6 model. Inside, the Terrain offers a black cloth interior with silver-tone accents. Maximum cargo space is 63.9 cubic feet with the 60/40 split rear seat folded down. The center console features a standard AM/FM/MP3 audio system, which includes a 7-inch touchscreen, a USB port, Bluetooth connectivity for phone and audio, and satellite radio. It can be upgraded to the IntelliLink multimedia system, which includes an integrated navigation system, Apple CarPlay/Android Auto compatibility, voice control, 4G LTE connectivity with Wi-Fi hotspot, and a Pioneer premium audio system. Standard features include an automatic dimming rearview mirror, ambient interior lighting, remote keyless entry, and cruise control. The Denali model comes with a more premium leather interior with chrome accents. Standard safety features include a backup camera and a tire pressure monitoring system. A severse sensing system, a blind spot monitoring system, rear cross traffic alert, rear park assist, forward collision alert, and lane departure warning are optional. 43 of 44 (97%) consumers said they would recommend this vehicle to a friend.